Though we had just stuffed ourselves with six J. Co donuts a few minutes before, Rina and I were looking to fill ourselves with something heavier during the rare times that Rina and I found ourselves at SM Megamall. 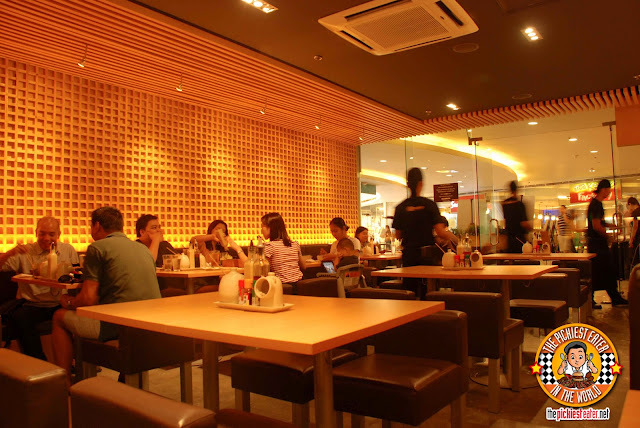 I had heard nothing but good things about Yabu: House of Katsu from some very credible sources, but I'm not really a huge fan of Japanese Food. As we were walking around the SM I took a glance at the menu of Yabu, and saw an item that caught my attention.. "Rosu Katsudon". All of a sudden it became clear to me, and eating at Yabu was now a must. 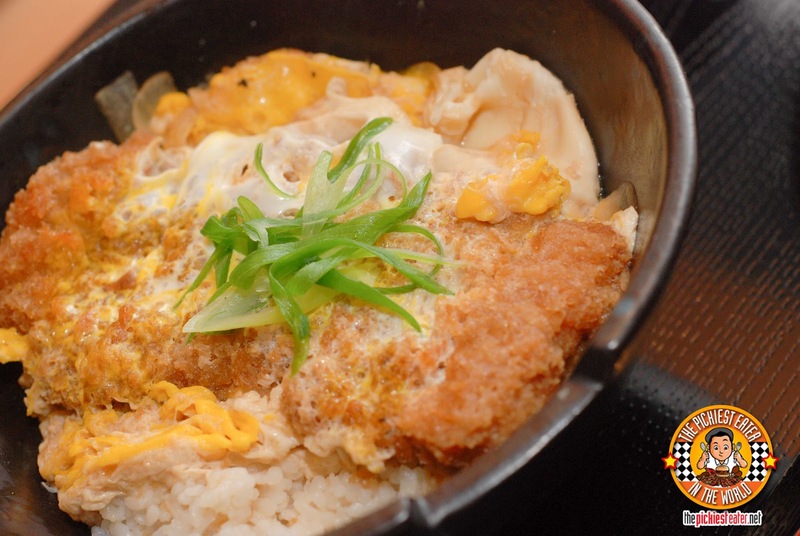 The first time I heard about Yabu, was when a friend of mine, Direk Yeyey, tagged me in a picture of this dish.. Rosu Katsudon. In the picture it said, "Rosu means it has a bit of fat in the meat so that adds a lot of flavor to the dish." So i answered, "You had me at 'a bit of fat'". As usual, we got there a little bit before the lunch rush, but the place already had a good number of people in it. in fact, we almost didn't push through with our trip there because the hostess was going to seat us in a cramped two seat table in between two other parties. I protested because there seemed to be enough empty booths to accommodate us (we had our camera and some of Rina's shopping bags -not to mention i'm a bit claustrophobic- so there was no way that tiny table would be comfortable enough for us to enjoy our meal). She said that all booths were full, which was weird because I don't think she realized I had eyes that would allow me to see otherwise (there were at least two available booths). So I said, "Miss, thank you, but never mind." and told Rina we'd go back another time. As we walked out the door, the same hostess chased me back and said, "Sir, we found an available booth for you! Would you like to take it?". Can you imagine how awesome I'd be if I played poker? 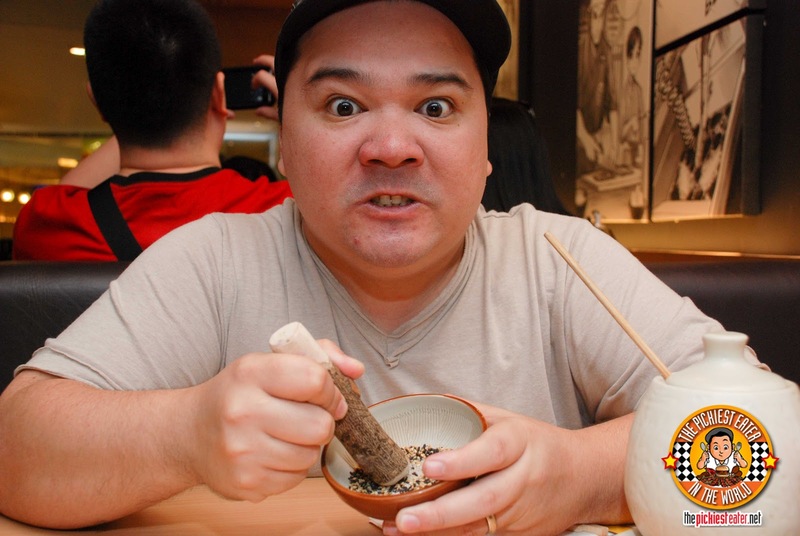 According to Yabu, the secret to achieving ultimate Katsu bliss can be achieved in Four easy steps. 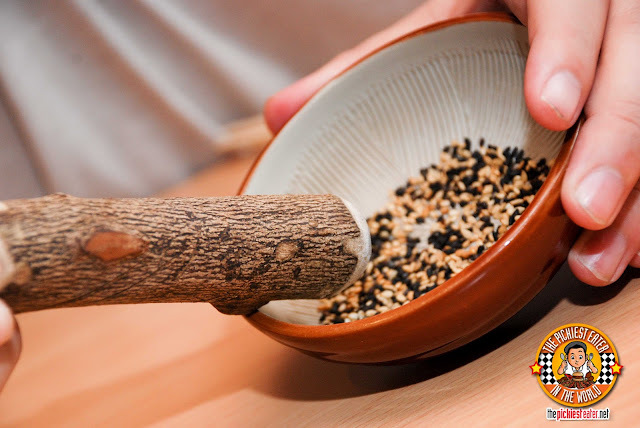 First, Grind the Sesame seeds (Both regular and Black) in the bowl they give you. The ceramic thing they provide you to grind the seeds up looks like a piece of wood, to make it seem like you're doing it just like they did in the good old' ancient days. Unfortunately, I'm not so good at grinding stuff, so no matter how hard grinded those seeds, I couldn't seem to penetrate their shell! It was like they were wearing an Adamantium bullet proof vest or something. Rina was getting a little worried I might break the bowl so she took it away from me after a while. And then when SHE started doing it, the seeds Miraculously turned into a fine powder.. not to mention she did it all with that beautiful smile on her face, as opposed to my constipated-vein-popping-out-of-my-forehead look. 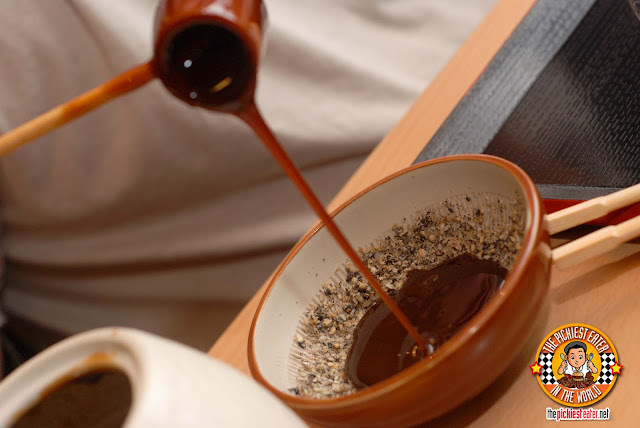 You second step is to pour the Tonkatsu sauce over ground up seeds. They provided you with this instrument that serves as your measuring spoon, but it kinda looks like a corn cob pipe. You fill up the "Spoon" with no less than three "Spoonfuls". Your third step is simply mixing up the sauce with the sesame seeds, then the fourth step is the no brainer.. Dip your Katsu into it and enjoy. 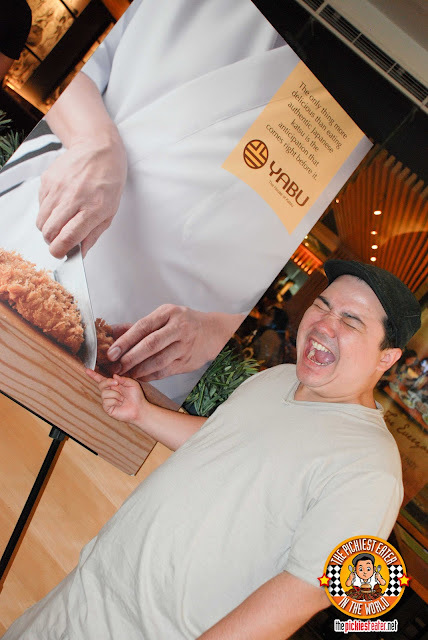 So now that I got that out of the way, it was time to see what Yabu was all about. Rina wanted Katusdon, so I took one for the team and gave her the Rosu Katsudon Set Meal (P295) that I went there for. Each Set Meal comes with Miso Soup, Japanese Pickles, Unlimited Cabbage (which you can mix with the Japanese Vinaigrette they provide you, which Rina enjoyed), and some sliced fruit. 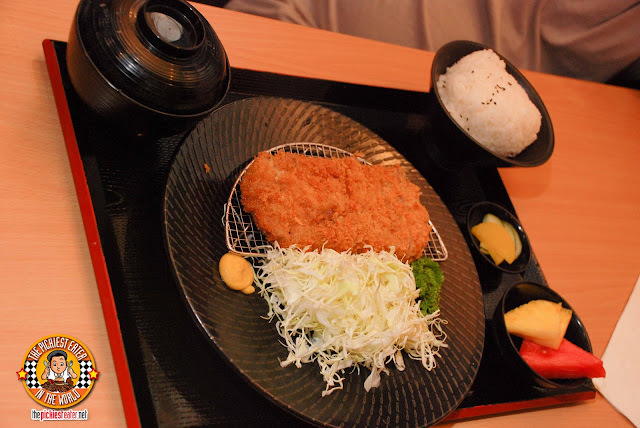 For me, I ordered the Kurobuta Pork Tonkatsu Set (P575). 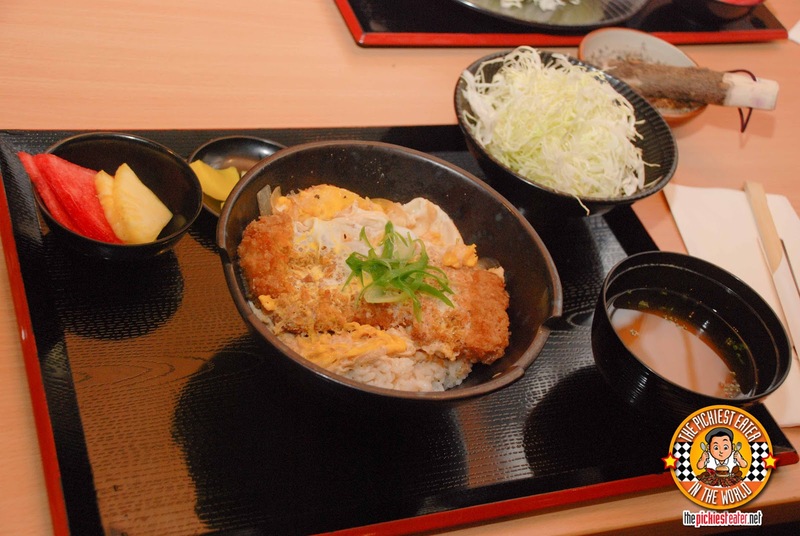 The meal came with the same stuff that Rina's Rosu Katsudon came with. Presentation wise, it reminded me of Ma Maison's Tonkatsu Meal as well, but maybe just a bit prettier. 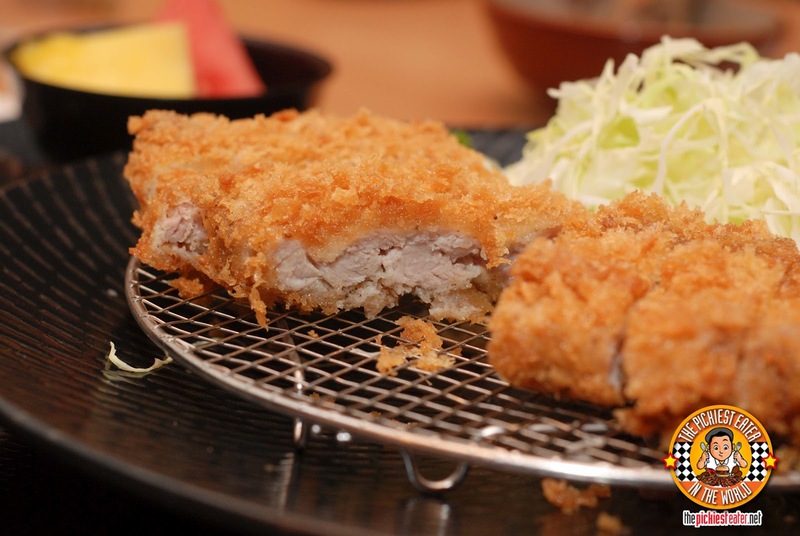 "Katsu" is actually an abbreviation of the word "Katsuretsu" (Gesundheit), which means "Cutlet". It also means "To Win" or "To Be Victorious", making it a tradition for students to eat it before an exam. Had I know that, perhaps I would've had this instead of the usual Spam before my trigonometry finals. Prior to eating at Yabu, I had mentioned that Ma Maison had the best Tonkatsu's I've ever tried. But it's almost unfair to compare Ma Maison's version to Yabu's Kurobuta Pork rendition of Tonkatsu. Kurobuta Pork is the "Black Angus" of the pork world, so in effect, it's like comparing a Black Angus cut of T-Bone to one you'd get from Batangas. The Batangas cut would be delicious in its own right, but the quality of the Angus simply smokes it out of the water. Here, the Kurobuta Pork will leave you baffled on how a piece of meat, especially one such as pork, could be so tender. After taking a bite, the crunchiness of the coating enveloped a piece of pork, that was so unbelievably soft, I couldn't make out what was the pork and what was the rice! This is definitely the Rolls Royce of Tonkatsu's. The only qualm I had with Yabu was.. well.. Let me put it this way. As soon as the waiter placed the platter in front of me, I said to Rina, "Watch I'm going to show you a magic trick.". Naturally, she was intrigued. After I demolished my Tonkatsu she asked me, "What was your magic trick?". I said, "I finished the Tonkatsu without touching anything else on the plate." She looked at my plate, and then looked back at mel, then I said an emphatic, "Tada!!". 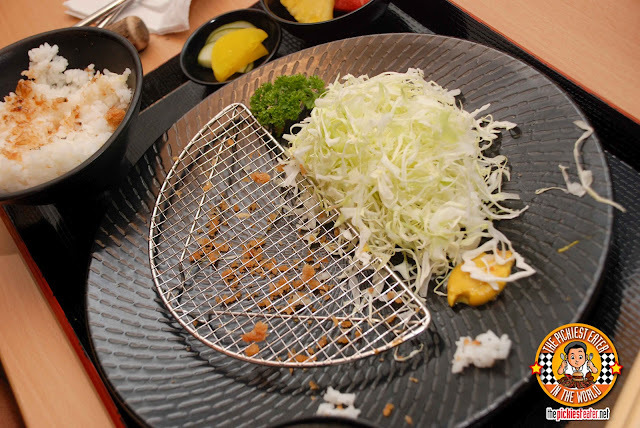 What I'm getting at, is that it would be nicer if Yabu offered an option of a (forgive me for going all fast food sounding) less expensive "Solo Meal", without the pickles, Cabbage, fruits and soup. Come on, let's face it, what the hell am I going to do with "Unlimited Cabbage"? Unlimited Cabbage to me is just about as useless as wedding vows are to Kim Kardashian. Admittedly, the prices, are quite reasonable for the quality that you get in return, however it wouldn't hurt to have an option without the "meal", just to make it more accessible to a wider market (but that's just me). Apart from that, there's not much else I could say negative about Yabu.. the food was excellent, the service was fantastic, and we got our food at a reasonable amount of time. Oh yes :D !!! This place is so good :D ! the fat on the pork katsu is just divine and it is cleaned and seasoned well so that you can enjoy the flavor of the meat. We tried this I think a couple of weeks ago when we had to go to Megamall to buy a grill for me to cook some steak sa "pamamanhikan"
I wonder why it has to be imported meat, though. Can't we replicate the growing conditions of the happy piggies from abroad so that we can have these tender pork cutlets in every establishment? Hey how'd your baby back ribs over holy week go? didn't see the pix yet! Oh no my list of restaurants to visit during my short two-week vacay in Manila is growing exponentially thanks to your blog. Ha ha I wish I knew of eating katsu before an exam, I'm also a Spam addict and still eat it for dinner to this day. This is the best, most sincere food blog out there. I'm a bit disappointed why I came about knowing this place just recently. 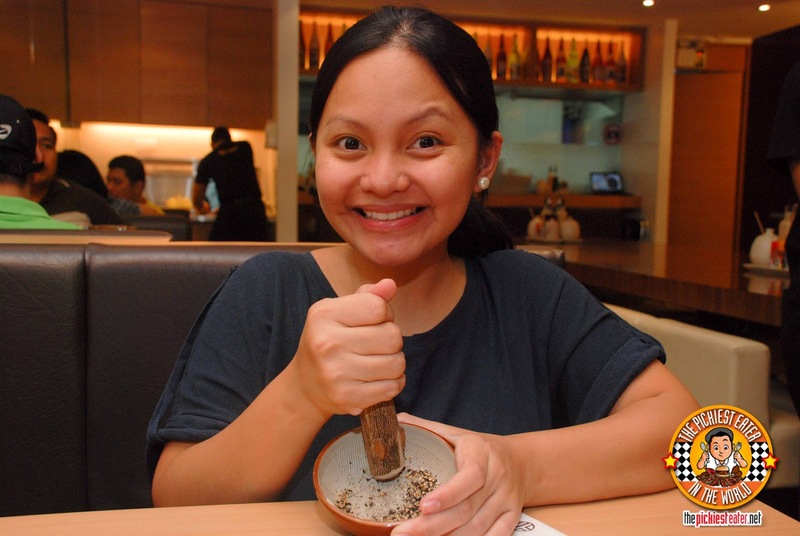 Congrats and more power to your blog Pickiest Eater! GeorgeP, you just made my day! Thank you so much!! See the difference between you and me is that, you're thinking of ways to share your meals, while I was thinking of a way to make it less "shareable" haha! I love this post of yours, it's informative, entertaining, and funny! I am definitely checking this place out if only to try the Katsu ritaul thingy, LOL. which proves that there are different strokes for different folks! hi! i enjoy reading your entries! It's so light, honest and entertaining! :D Is the serving size of the tonkatsu same as that of Ma Maisaon? I actually liked the cabbage + dressing in Ma Maison so I was pleased to know that Yabu offers unlimited cabbage haha! But is the dressing the same w/ Ma Maison? Thanks! Thank you Zaela! Size wise, any disparity between the meats would be negligible.. more or less it was the same..
regarding the dressing.. umm.. sorry but I didn't try it so I couldn't answer you for sure! The only two tips I can give you is: Always have fun with what you're doing, and let it show in your writing! From the looks of how your blog is going, you don't seem to need much tips because I think you're doing a great job! I also find the unlimited cabbage a bit odd too. In my thoughts, they just did it in order for them to say that they have something unlimited which they could offer. (BUT haha! Who knows if there's a deeper meaning to it?) Okay, I don't know what I'm trying to put across here anymore. HAHA! You should really try it Hazel! Love your comment on the unlimited cabbage! :D I'm not a vegetable hater but I also didn't know what to do with the cabbage shreds since I'm not really a fan of it. I liked the soup, rice and fruits, but the bf only ate the soup and katsu.. >.< If you go to Yabu next time, try their appetizers.. :D We got to try the wakame and potato salad and they were as awesome as the katsus! I really believe your BF and I would get along great, Sumi! haha!! NYahaha i love your picture whilea eating katsudon... lol... so funny... I have seen this at Megamall and will might try this one out. Btw. Just followed your blog. It's kinda expensive pala! Been meaning to try it after hearing tons of folks saying it's good, but I still haven't found the time! Ugh. You know, Allen, we have the same mentality.. I also considered "Katsu" pretty much the "safest" Japanese dish to order.. You should give this a try! 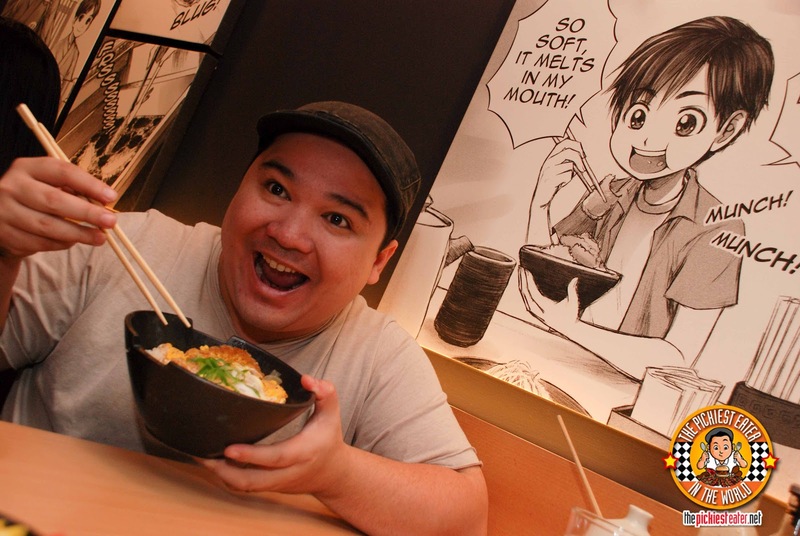 especially their new SPECIAL Katsudon! So sorry to hear that Jake! Truth be told, you're not the first person to tell me that. I personally didn't have that experience. 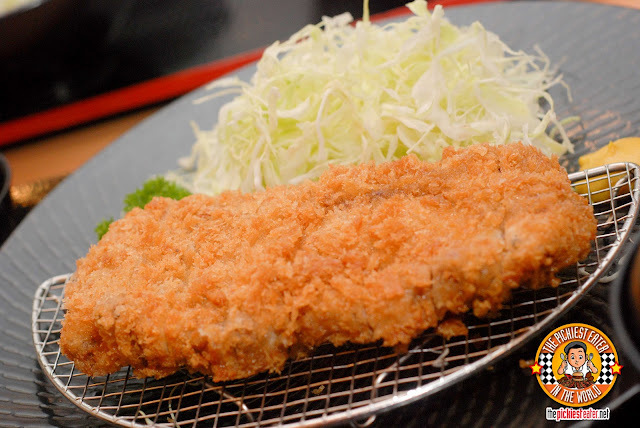 Have you tried their new dishes, like the Menchi Katsu? It's pretty fantastic!